The Bowflex Max Trainer M5. This piece of training equipment is created by the Bowflex brand. A company that has been leading the way in exercise machinery for many years now. A super advantageous element to the Bowflex Trainer is that it takes up relatively little space when it comes time to use it. Most ellipticals or treadmills are quite bulky in size and, as such, take up quite a bit of space. This isn’t the case with the Max Trainer. All you need to have in order to workout on the Trainer is an area of 2’1” x 3’10”. This is a very small area of space and ultimately it means that you can enjoy a workout on this machine in any room of your house. It also means that the M5 is incredibly easy to store due to its relatively small size. Storage is always a key concern when it comes to home gym equipment and it’s definitely a positive when the equipment in question is economical in this regard. This hybrid machine works to deliver a maximum workout on each occasion. It achieves this by possessing a drive system that provides resistance settings and levels that are perfect no matter what shape you are in. Whether you are a complete beginner or a seasoned fitness veteran, this machine has a setting that will give you a top-quality workout. The 16 different resistance levels and 9 unique training routines are easily accessible through the digital controls that are very user friendly in their design. The backlit screen also ensures that everything is portrayed in an easy to view manner. This Bowflex creation has comfortable foot pedals which are obviously quite key not only for an effective exercise session, but also for a safe one. If such pedals were made from cheap, ineffective material then serious damage could be caused if you were working out at speed. The people behind this machine foresaw this issue and thus took special care to use high quality grooved rubber that supplies the maximum grip for your feet. There are also fittings attached to the top of the pedals that keep your feet in place as you pound out your exercise session. Media and water bottle holder – this may seem trivial put its amazing how many such machines do not incorporate a place where you can store a bottle of water or your phone. The Max Trainer M5 doesn’t have this problem, which is a good thing as you’ll definitely need to be rehydrating as you exercise on this high intensity piece of machinery! Different color combinations – this hybrid machine is available in its standard silver and red color which is sleek and professional in appearance. However, even cooler, it can also be purchased in three unique college themed options: Florida State University, University of Michigan; and the University of Florida. These options look brilliant and are great way of representing for past or present students/staff members. 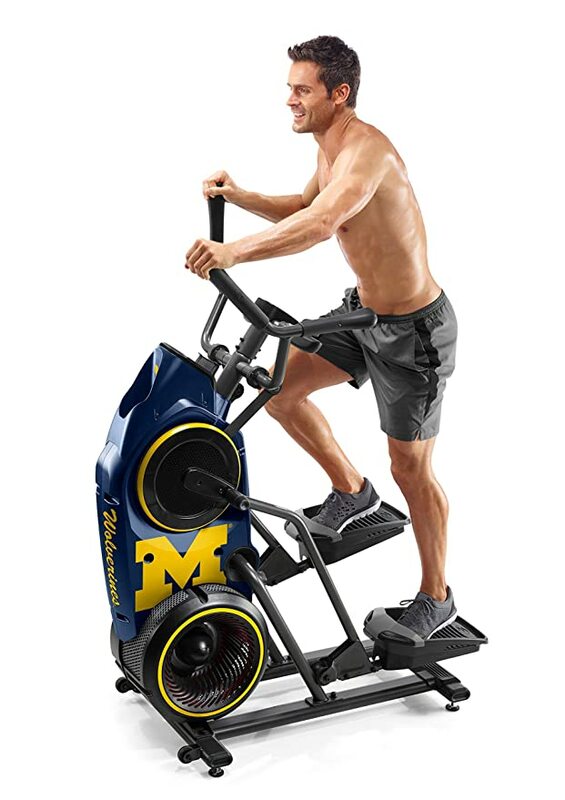 It must be said that there are many elements to this hybrid exercise machine that makes it a tantalizing alternative to both ellipticals and treadmills. The reason for this is because the Max M5 takes the best elements of these two age-old exercise machines and combines them into a super hybrid. The M5 takes the full-body workout functioning of an elliptical machine and matches it with the speed and intensity supplied by a treadmill. The key differences are that it nullifies the harsh, joint damaging impact of a treadmill, as well as removing the limit of speed/intensity that plagues ellipticals. So, in a nutshell, you get the best of both worlds with this hybrid. Target-Zone & Burn-Rate Indicators: these allow you 100% control over your workout, including keeping count on how many calories you’re burning. Heart-Rate Monitor: included is a wireless chest strap that monitors your BPM so as you know exactly what intensity your workout level is at. Heart rate can also be monitored by gripping the sensors located in the handlebars. Bluetooth 4.0 Compatible: allows you to sync with the relevant app for a superior training session. Free Max Trainer App – by using the Bluetooth connectivity feature, you can seamlessly sync with this free app that has been specifically designed to enhance your Bowflex workout. This app allows you to perform a whole host of different functions including setting and monitoring new goals; keeping a progress record; streaming videos created by Bowflex’s array of personal trainers; and much more. The app is available for Android and iOS users. Question 1: Does it suit all types of gym users? Answer: Absolutely. I will explain more about this in a coming section, but this machine is ideally suited for any type of exerciser enthusiast. This is because it has multiple functions which means that all fitness levels are catered for. Question 2: Does this machine deliver a top-quality work out? Answer: Without question it certainly does. The Max Trainer M5 has been created for one single purpose – to push the human body to its limits in a safe manner that guarantees your fitness reaches that next level in super quick time. Question 3: Is it the best option on the market today? Answer: It’s up there as the top option. As explained above, this machine is widely believed to have the edge over ellipticals and treadmills. It is also seen as being superior to other hybrid models due to the fact that it’s so sleek and slimline in its appearance and weight. Question 4: Ultimately will this machine deliver the results I want? Answer: If you put in the work and use this machine regularly then there is no doubt that the Bowflex Trainer will deliver your fitness goals. Though it must be noted that hard work is still needed! This is not, and there never has been, a work-free way of getting fit! Each one is uniquely designed to hit specific goals. The blue backlit display has a built-in tachometer which shows you your target and burn-rate zones. This gives you a concise reading of where exactly you are in your workout and how far you’ve got to go to reach your goal. Special Note: the Max Interval programme is really something special and is the standout choice of the 9 options. It consists of a 14-minute interval workout that will push you to your limits. What’s really great about this option is that it’s so economical – you can benefit from a top-quality cardio session within 15 minutes! A great accessory that is available for the Max Trainer comes in the form of a heavy-duty equipment mat. Designed by SuperMats, these mats are ideally suited for such equipment as the Bowflex, ellipticals, or treadmills. The SuperMats measure in at 2.5 feet x 6 feet, so there is ample space for any type of machinery. The main aim of such a mat is to afford you floors at home 100% protection when you are using a weight or exercise machine. This is guaranteed by the super-tough and durable protective makeup of the mat. In addition, these mats also help to dampen the noise of the equipment that is being used on it. This is especially prevalent in a home gym scenario where a family member or loved one might be reading or working in the next room! These mats are all created in the US and contain no harmful chemicals or heavy metals so there will be no need to be concerned for small children or animals. 1 – DIY: take you time and read the assembly manual carefully if you are going to put it together yourself. It’s also worth having a look at some online instructional videos for that added visual aid element. 2 – Outsource it: you could also simply pay a professional a small one-off fee to assemble this machine for you. This is probably the best option if I’m being honest. It will save you the time and effort as well as supplying you with peace of mind knowing that it has been assembled correctly. Machines of this nature are usually quite time consuming and even tricky to assemble correctly. Though, the great aspect about the Bowflex Trainer is that once it is assembled, it’s incredibly easy to move about; to store; and there is no need to take it apart again. As with every product, what the market is saying is of vital consideration. By looking through customer reviews and testimonials, you can learn everything that you need to know about any given product or service. With regards to the Max M5, the market very much approves of this machine. The reviews are overwhelmingly positive, proven by the fact that this machine is Bowflex’s top seller. The price range of for the Bowflex Max Trainer is over $1000. This might seem a bit steep, but you must consider what you are receiving for this price. The Bowflex M5 is a gym standard piece of training equipment that will provide you with countless high-quality training sessions. We are quite taken with the Bowflex M5. It is truly a revolutionary piece of training equipment that allows you to engage in a gym level session from the comfort of your own home – this, after all, is exactly what you want from such a piece of machinery. This hybrid machine is suited for complete beginners as well as seasoned fitness pros, ensuring that a person from any walk of life can increase their levels of fitness in a very short time. 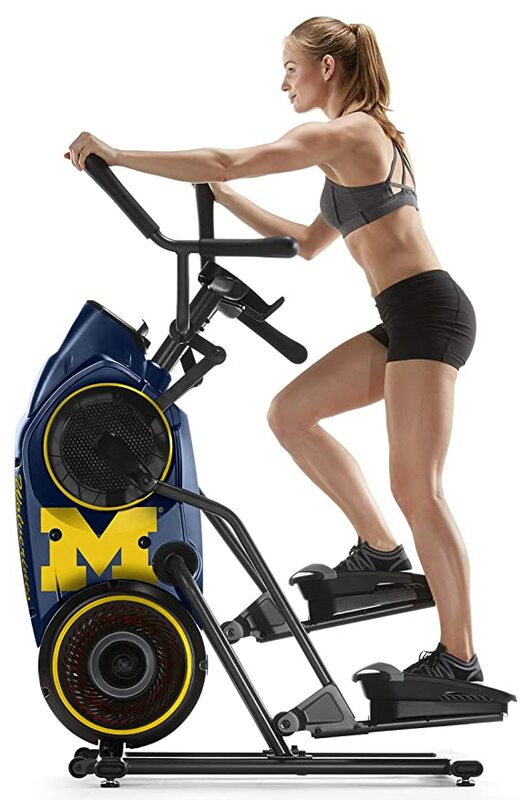 Burn calories, shred fat, improve cardio, and build lean muscle – this in a nutshell is what the Max Trainer delivers, and it all comes in the form of a super economical machine that takes up little to no space when in use and when stored. I hope that you found this Bowflex Max Trainer M5 review helpful and insightful. Please don’t hesitate to get in touch with us if you have any additional queries regarding this product.